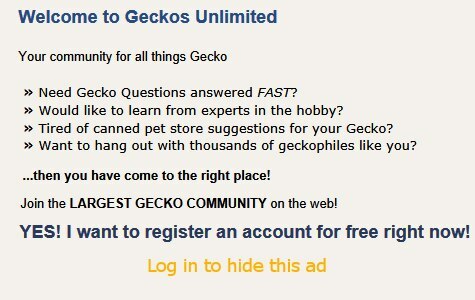 So, totally new to geckos. Have had some snakes in the past, but this our first gecko experience. My wife when to buy an enclosure that she wanted for a future lizard purchase, but it ended up coming with 2 leopard geckos. So, on to learning about them quick and dirty. We are arguing over what morph they are. What do you think? They are probably Murphy's Patternless or possibly blizzard. Check leopardgeckowiki.com for more info. THere's a nice care sheet on this forum. Please consider removing the sand. It's not their natural habitat (which is hard, packed ground, not Arabian Nights) and there is some danger of impaction. There's a nice care sheet on this forum. Please consider removing the sand. It's not their natural habitat (which is hard, packed ground, not Arabian Nights) and there is some danger of impaction. I am reading that about the sand. We just brought them (in their enclosure) home from the original owner and that is what was in there. I am looking at what to use instead. What is your favorite substrate? consider tile, its easy to clean, more natural, looks good, and is easy to clean. are they housed together? how big is the tank? please move them each of them to two 20 gal different enclosures, do you have an under tank heat mat? they need one to digest since they absorb heat through their belly. Thanks for the info. I usually do more homework before getting a pet. This was unplanned and now I am behind the 8 ball. They are currently housed together. Here's the short form of one of GU's main leo care sheets. Here's a quality article about leopard geckos in their natural habitat. Sexing Leopard Geckos -- Leopard geckos become sexable at about 6 months old. Males can be distinguished from females by a distinct /\-shaped row of pores above the vent and by two hemipenal bulges below the vent. To see their vents, potential male pores, and hemipenal bulges gently press their bodies up against the glass. They'll squirm if you try to turn them over. Last edited by Elizabeth Freer; 01-17-2019 at 01:27 AM. If they are both females and are doing well together (i.e. both eating, no one losing weight, no one with "unexplained" scratches or bite marks, one not sitting on the other all the time) you can probably leave them together.